My mom would make Pantzaria xydata (beet preserved in vinegar), when they were in season and I have carried on the tradition with my family. They are amazing as a side dish, an appetizer, in salads and make the best combination with cheeses or yoghurt, not to mention that they can be used to garnish your dishes. 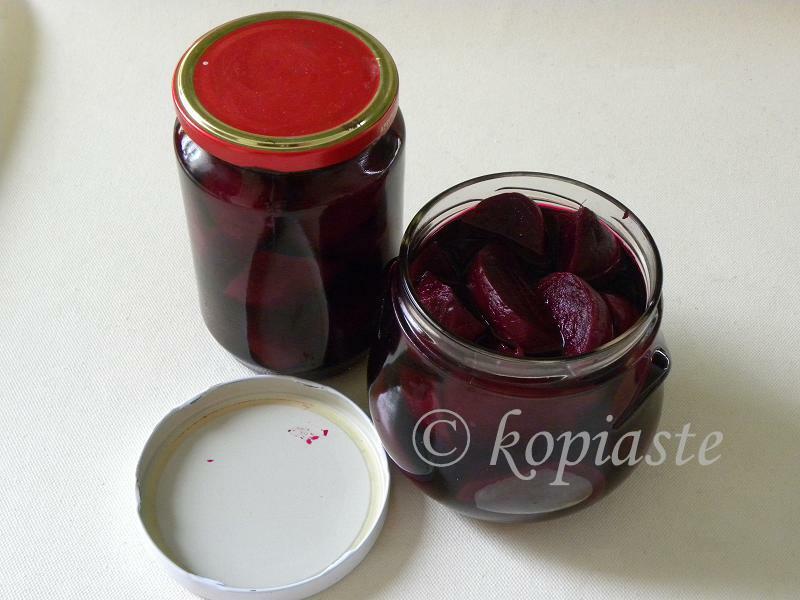 I have been preserving beets in vinegar (ξύδι = pronounced ksydi = xydata (in vinegar)) for many years but I have never blogged about it. In most of my recipes with beets, I usually roast or boil more so that I can preserve them and I have used these preserves in a lot of my recipes. The natural combination of sweet from the beets and sour from the vinegar is just perfect. By preserving them, you can have them all year round in the refrigerator and the more time they are left in the vinegar, the better. Preheat oven to 200o C / 400o F.
Wash the beetroots well and wrap them in aluminum foil. Place them in a baking tin and cook in the oven for about 1 hour. If the beets are big it may take more time. You can test them by piercing them with a fork. If the fork penetrates them easily, they are ready. If they are not soft and tender wrap them again and continue cooking. An easier way to cook them is by steaming them in the pressure cooker. Add some water in the pressure cooker and put the beets in the basket. When the valve starts spinning, lower heat and cook them for about 20 minutes, depending on their size. In both cases the beet skins will come off easily when pressure is applied with the thumb and the skin is rubbed back and forth. (Wear disposable gloves to avoid red hands). Remove the stem and root ends, and cut them into 4 or 8 pieces. Whenever we cook beetroots, if the leaves are tender and fresh, we never throw them away as the leaves are edible and make this wonderful salad. The leaves add a delicious flavour to the warm salad, along with the garlic, olive oil and vinegar. This salad accompanies fish beautifully. Choose the most tender leaves, wash them thoroughly and boil them in salted water for 10 minutes. Drain them in a colander and cut them with a knife into smaller pieces. Add some of the roasted or preserved beets, a clove of garlic finely chopped, olive oil, red wine vinegar and salt and pepper (optional) to taste. This amazing vegan salad is amazing as it combines sweet oranges and beets, sour from the vinegar and of course salt. If you are vegetarian you can add some feta and less salt. Place the beetroot, oranges, coriander and walnuts in a salad dish. In a food processor or mixer add the vinaigrette ingredients and mix. Drizzle over the salad, mix and you are ready to serve. I love the colours of that salad Ivy…great stuff. Beets in vinegar. Sounds sour and yum. Salad looks yummylicious. I just sent my entry with picture to Bloggeraid. I love beetroots and that recipe looks really interesting! What a luxurious salad! My mom used to pickle beets and they were always a welcome addition to the table. Again, your talents in preserving foods shine here. This is very interesting and certainly very healthy! We also pickle some of our produce but we do not add olive oil. Just the vinegar and herbs. ooh…the last photo really sold me! Looks so bright and fresh. That’s a great dish! I wish my husband and kids liked beets, but alas, I am the only beet lover in the family. This looks beautiful and tasty. Looking forward to see what Joust entry you come up with! Your photo is G-R-E-A-T and the combinations of colors really made the beetroot stood out perfectly! Yes.. I’m crazy of beetroots… not only the taste but the luminous magenta/dark pink(?) color, really attracts me (on that as well as Pink Pithaya/Pink Dragon Fruit). In my hometown, there’s a certain cafeteria & eatery joint by the sea that blends beetroot with other vegetables plus protein powder (lecithin, B2, etc) 😀 I lurked there for its food and drinks… best of all free WiFi. I love beets, Ivy, any way and every way! The salad is gorgeous!